Ease into the warm comfort of the contemporary accommodations at the Moab Valley Inn in Moab, Utah, where every room is guaranteed to be relaxing, clean and smoke free. Here, modern design and nature blend seamlessly, directly at the edge of the Utah desert. From 125 beautifully appointed rooms to 18 spacious suite accommodations perfect for families and executives, you’ll find every amenity necessary for a relaxing stay. After your day of desert adventure or exploring Arches National Park, the Moab Valley Inn provides all the modern touches of home, including free wireless Internet access, an in-room refrigerator, in-room safe, coffee maker, hair dryer, iron and ironing board. We also offer lodging that is handicap-accessible, along with Jacuzzi tubs, microwaves and wet bar accommodations so you may unwind in style. A deluxe room with one King Bed, complete with refrigerator, in-room safe, coffee maker, iron and ironing board, 32" flat screen TV's, Eco-Friendly bath amenities, hair dryer and free Wi-Fi. A deluxe room with two Queen Beds, equipped with refrigerator, in-room safe, coffee maker, iron and ironing board, 32" flat screen TV's, Eco-Friendly bath amenities, hair dryer and free Wi-Fi. Our spacious 3 Queen Bed room is ideal for families. This room comes standard with refrigerator, in-room safe, coffee maker, iron and ironing board, 32" flat screen TV, Eco-Friendly bath amenities, hair dryer and free Wi-Fi. A spacious deluxe suite featuring 1 King Bed, complete with jetted tub, wet bar, microwave, 2 32" flat screen TV's along with all the amenities of our standard rooms such as refrigerator, in-room safe, coffee maker, iron and ironing board, Eco-Friendly bath amenities, hair dryer and free Wi-Fi. These large, family friendly deluxe suites feature 2 Queen Beds, jetted tub, wet bar, microwave, 2 32" flat screen TV's along with all the amenities of our standard rooms such as refrigerator, in-room safe, coffee maker, iron and ironing board, Eco-Friendly bath amenities, hair dryer and free Wi-Fi. This 2 room Executive suite comes with a spacious living room that features an eight-person conference table, 32" flat screen TV, sofa sleeper, love seat, refrigerator, in-room safe, wet bar, microwave and half-bathroom. The suite’s master bedroom includes one King bed and a full bathroom as well as an additional 32" flat screen TV and Eco-Friendly bath amenities. 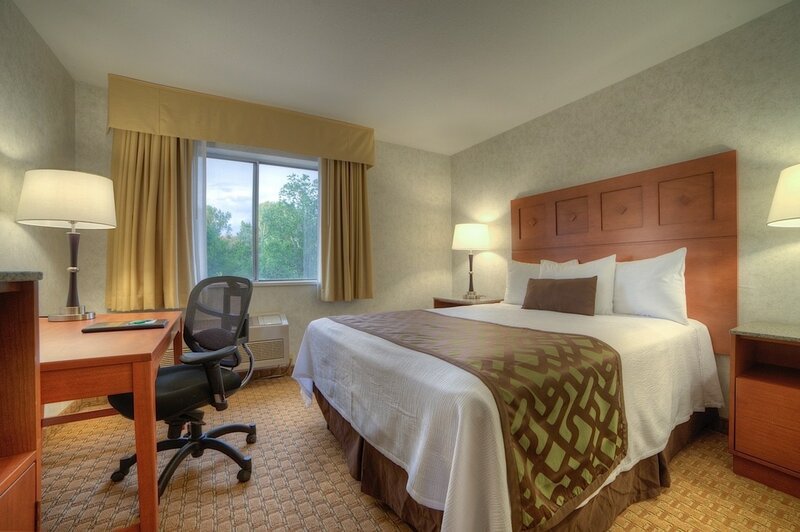 This deluxe handicapped accessible room features one Queen sized bed, complete with refrigerator, in-room safe, coffee maker, iron and ironing board, 32" flat screen TV's, Eco-Friendly bath amenities, hairdryer and free Wi-Fi. Extra large bathroom with handrails, moveable shower seat and an adjustable showerhead.